Many small towns and cities around Wisconsin feature one of a kind landmarks that make their town unique. Whether these landmarks are restaurants, museums, or hotels, we can all agree that there’s something special about spending the night in a boutique hotel. Break away from the chain and check out these great places to stay around Wisconsin. Steps away from Camp Randall Stadium in Madison, you’ll find HotelRED. Named after the primary color of Madison’s beloved college football team, the Wisconsin Badgers, HotelRED features modern red-themed style and friendly service. On the outside, you’ll notice red windows with large balconies. On the inside, you’ll find spacious, beautiful rooms, as well as a novel restaurant and bar, fitness center, and meeting spaces. HotelRED is pet friendly, so you’re welcome to bring your furry friend! As a recipient of both the AAA Five-Diamond Award and Forbes Five-Star Award, The American Club in Kohler offers gracious hospitality and deluxe accommodations. Experience large, spacious rooms and suites with all of the amenities of home. Be sure to make your appointment at Kohler Waters Spa for a a body treatment or massage therapy. In the summertime, golf packages are available at the nearby award-winning Whistling Straights and Blackwolf Run golf courses! Since 1893, Milwaukee’s Victorian-style Pfister Hotel has been providing guests with an above and beyond hotel experience. Their lavish guest rooms are the perfect combination of old-world charm and contemporary luxury. Their feather bed toppers and blankets will make you want to stay there every night! In the evenings, be sure to check out BLU on the 23rd floor. This lounge features classic cocktails, sassy martinis, and incredible panoramic views of Milwaukee and Lake Michigan. Experience a calm and inviting atmosphere at Copper Leaf Boutique Hotel & Spa in Appleton. The ambiance of the hotel has a modern, yet charming feel. The hotel’s staff provides you with the undivided attention you deserve. 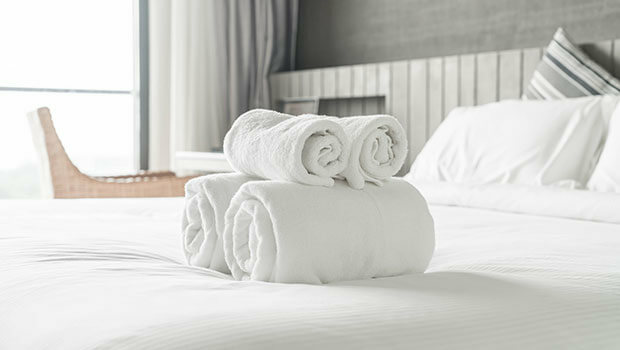 Each room features plush down comforters and pillows, high quality bed linens, fluffy towels, and bath robes. The fitness center and free high-speed wireless internet is a bonus! On the shores of Green Lake, the deepest natural lake in Wisconsin, Heidel House Resort & Spa has been helping guests relax and unwind for over 60 years! Enjoy fresh Wisconsin air, exquisite dining options, championship golf courses, and an award-winning spa. Whether planning a vacation, attending a meeting, or experiencing a breathtaking wedding, Heidel House is a one-of-a-kind resort for both couples and families. Nestled on the western shore of Lake Michigan, Blue Harbor Resort is Sheboygan’s escape for relaxation, fun, and comfort. Enjoy aquarium and boat-house themed rooms and wake up to a beautiful pink-orange sunrise. People say “It’s Better at the Blue” and I wouldn’t disagree. They have a 54,000 square foot indoor waterpark for all ages, diverse dining options, an on-site spa, spectacular meeting and wedding space, and private villas for a more relaxed visit. Shake your stress away at Blue Harbor Resort. Experience all of the comforts of home at The Osthoff Resort in Elkhart Lake. Their spacious one-, two-, and three- bedroom suites all offer spectacular views of either the lake or woodland. Lakefront watersport and bike rentals are available Memorial Day through Labor Day. On-site, you’ll find a cooking school for guests with fabulous workshops to enhance your basic cooking skills. The Aspira Spa, fitness centers, arcade and game room, and gift shops all make the Osthoff a truly unique experience. The Charmant Hotel in LaCrosse is a boutique hotel located in a renovated candy factory that was built in 1898. Charmant was a premium line of chocolate produced in the candy factory. It also is the French word for “charming.” Each of the 67 rooms are stunning and a little different. Depending on the room you book, you may find vintage brick walls, marble vanities, a private balcony with seating, tile floors, and a beautiful view of the Mississippi River. Each vanity includes C.O. Bigelow bath products and yeah in-room mini bar features items local to the LaCrosse area! Wausau, Wisconsin is divided in half by the Wisconsin River. Located on the Eastern side, you’ll find the Jefferson Street Inn. This luxury full-service hotel is just steps from high-end shopping, a green space venue where outdoor concerts and farmers’ markets take place, and many unique dining options. It is also just a few minutes from Granite Peak ski area and kayaking areas along the Wisconsin River. Most of the rooms include a fireplace, sitting area, cozy spa robes, Aveda bath products, Starbucks coffee, and many other luxury amenities! Enjoy use of the indoor pool, the day spa, and enjoy a delicious meal at City Grill Bistro. Jefferson Street Inn is also pet-friendly! Woof! The Iron Horse Hotel offers a unique Milwaukee experience. Built inside a 100 year old warehouse, each room features a mix of modern decor with original architecture, such as wood posts, exposed brick walls, and large windows. Amenities include a 24-hour fitness center, available spa treatments, pet-friendly hotel packages, motorcycle rentals, and exquisite on-site dining option. The Iron Horse Hotel is also the perfect setting for wedding and meetings, offering a variety of spaces with a unique charm.